MARIA ANGELICA GODOI Millan, is a Chilean mature PhD student since Jan 2004, and after being away from her studies for nearly two years, she is just closer to completion. Maria Angelica's research deals with the reconstruction of the palaeoenvironmental history of South-Western Patagonia, Chile, after the termination of the last glaciation and through the Holocene. She is studying shallow marine sediments (<100m water depth) from the system of fjords and straits that branches off from the Strait of Magellan, near its Pacific entrance. Sedimentological, tephrochronological and biostratigraphical methods are being applied to better understand the timing of ice retreat after the last glaciation, and the environmental changes that have characterised the area in relation to marine and atmospheric circulation. This work includes the assemblage of benthic Foraminifera profiles and identification of "cryptotephra" layers. 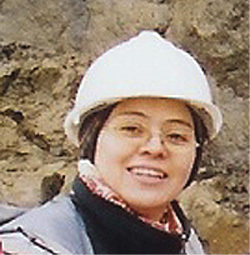 Maria Angelica holds a degree in Chemical Engineering (Universidad de Magallanes, Chile, 1994), and an MPhil in Polar Studies (University of Cambridge, 1998). She has previously worked in ice core studies and glaciology, as part of the Glaciology research group of the Universidad de Magallanes (www.umag.cl) and the Centro de Estudios del Cuaternario (www.cequa.cl), in Chile. She is also part of the CASA initiative (www.casa.aq), to study climatic links between Antarctica and South America.